Why not have model cards as stylish as you are? Put your best face forward with our double-sided zed cards (aka model cards). These 5.5x8.5" cards include up to 3 photos on the front and up to 6 on the back - a great opportunity to show off your many looks! For no additional charge, we'll Rock Your Zed Card and create a custom design just to suit your style. 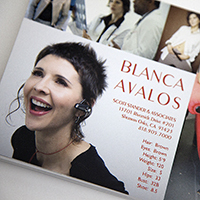 Zed cards are printed on cardstock using an offset printing process. Cardstock items are typically processed in 2-6 business days after the proof is approved, and SHIPPED FREE via UPS Ground (domestic only).